Legendary’s GODZILLA ENCOUNTERS Site Goes Live! – SKREEONK! Legendary’s GODZILLA ENCOUNTERS Site Goes Live! Or viral, should I say. The world is ramping up for Legendary’s reveal of some Big G sized awesomeness at SDCC next week, and the studio is apparently off to a sneaky start. 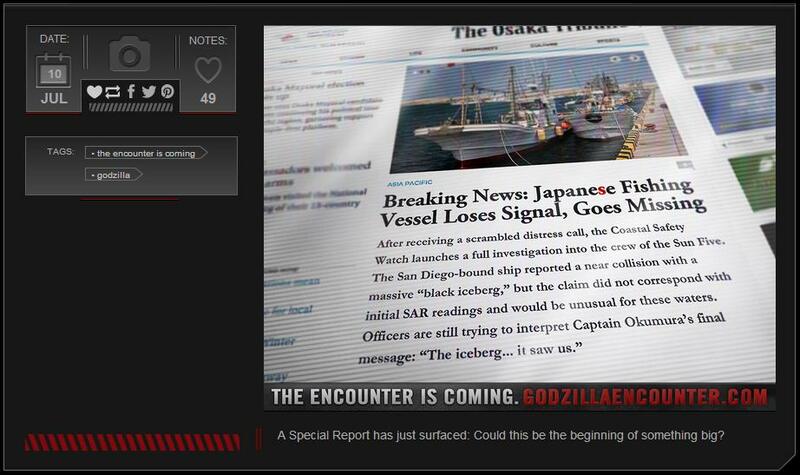 GodzillaEncounter.com went live earlier today featuring two ‘news stories’ pertaining to some rather… odd happenings. Mysterious, right? I mean… what could these strange incidences coincide with on a site called… Godzilla Encounters? All sarcasm aside, I’m guessing we may be treated to some eventual photos of ‘encounters’ with the new Godzilla design. Clever viral marketing always leads somewhere – and I’d say sometime next week (after several more random natural disaster type updates) we’ll be treated to some ‘real time’ photos of the titular monster. We shall see! Click the link or photo above to visit the site and sign up for Legendary’s Godzilla newsletter. Exciting times are ahead for us fans! Next Post Hot Topic Teases Our First Real Look at Legendary’s GODZILLA Merchandise – And its a Badass T-Shirt! Previous Post New Hawaii Set Photos & Videos for Legendary’s GODZILLA!